Uniregistry has announced a number of TLD price increases that will take effect on September 8th, 2017. A number of other registries are also increasing prices for certain TLDs. Read on to learn more. These price changes come into effect on September 1st at 00:00 UTC. 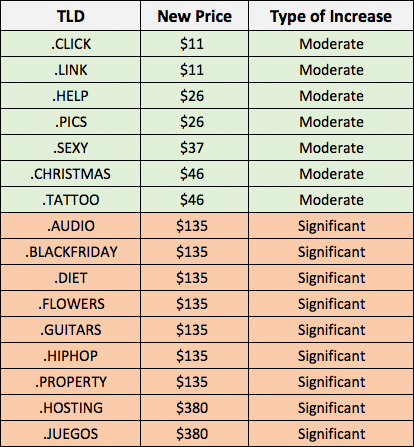 Moderate price increases - The prices for TLDs with moderate increases will renew at the new pricing. Significant price increases - The prices for TLDs with significant increases will be grandfathered. This means that domains registered BEFORE September 8th, 2017 will renew at the original, pre-increase price going forward. The previously registered TLDs will be treated as Premium therefore you will need to have Premium TLDs enabled. If you choose not to support Premiums via WHMCS you can renew these names normally via your Enom account directly. To adjust pricing for new domain registrations, navigate to Setup > Products/Services > Domain Pricing and click on Open Pricing next to the TLD you wish to change. To adjust pricing for your existing customers and their domain registrations, you can use Bulk Pricing Update Utility. You may also want to consider renewing any of the domains listed above that you own early to avoid the upcoming price increases. You can also encourage your customers to renew early by sending out a targeted email marketing campaign using the Mass Mail Tool in WHMCS.